Note: These plans consist of a booklet of 11 pages of text, drawings and photos on 8.5" x 11" pages plus an 18" x 24" drawing. The printed version is black and white. The PDF file for instant download has color photographs. To save $10 and postage costs choose the download option below. 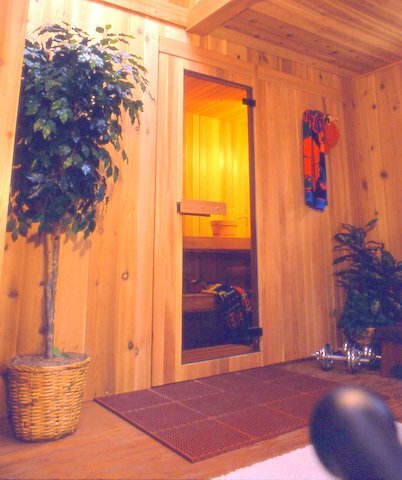 Built on a pier and beam foundation to take advantage of a patch of rocky hillside ground behind a Montana cabin, it was equipped with a large traditional Finnish sauna in one corner and a variety of exercise equipment including a bike on a wind trainer, a Concept rowing machine and weights. 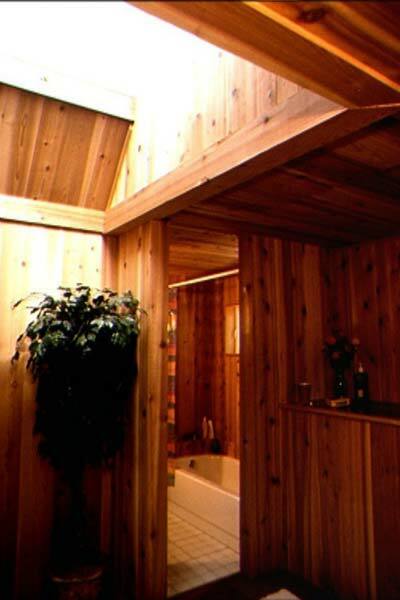 It also contained a full bathroom with tub and shower and a solo cedar therapy tub for soaking away aches and pains. 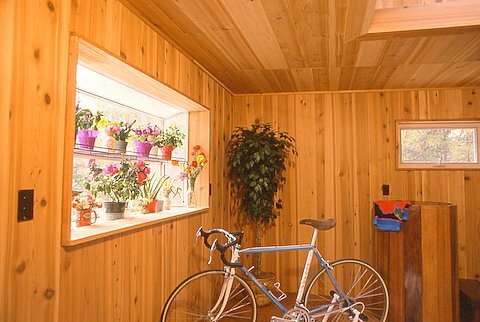 A greenhouse window facing east provided indoor plant space and welcomed morning sun over the Continental Divide. The large centrally located skylight overhead provided interior light over the 256 square feet of floorspace. A sound system completed the package, making for pleasant early morning workouts. 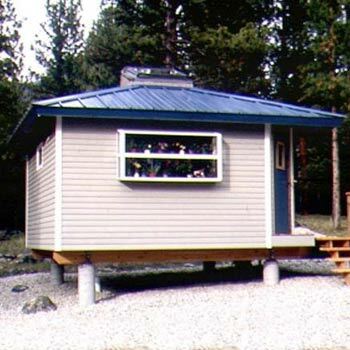 Originally published in Workbench magazine as the "Utility Cabin", it became popular in many variations including a guest cabin, storage, studio and workshop shape. Designed specially for utilizing rough terrain, the four rebar-reinforced legs elevate the cabin above grade, and deep snow, providing a simple and adaptable foundation system. 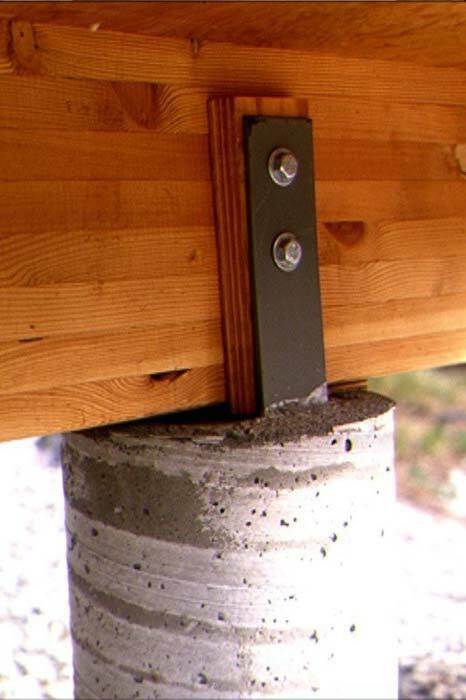 The foundation on our cabin was built by two people in half a day, and as soon as the cement in the tube forms cured, the horizontal support beams were bolted in place and floor joists were laid across. 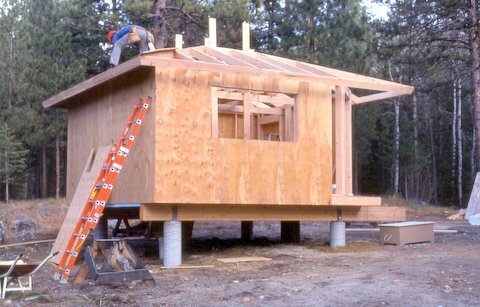 The hip roof for the small 16 x 16 cabin, with a large skylight in the center, provided an interesting and open interior, which was paneled and trimmed with cedar. 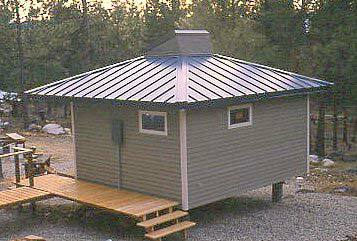 Building plans include a step-by-step building manual and blueprints, all written for amateur builders.